Last Sunday I unveiled my lone 2013 new year’s resolution: read fewer books. In a post later in the day, I described a strategy that has been working so far: read a book that is beautifully written, but on a subject you aren’t greatly interested in. The beauty keeps you going from day to day; the lack of interest allows you to put it aside after 10 or 15 pages. The book to which I was applying this strategy was Paul Elie’s The Life You Save May Be Your Own: An American Pilgrimage, in which I had reached page 115. But then an alternative strategy emerged. Read a book that is 1050 pages long. I’ve put Elie aside temporarily in order to pursue this approach. The book? 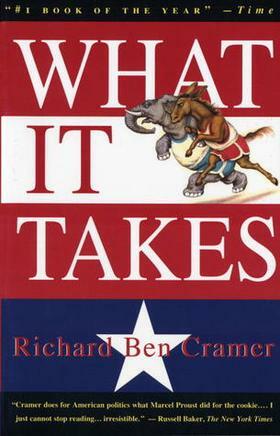 Richard Ben Cramer’s What It Takes: The Way to the White House. I can say with confidence that I’m not the only one immersed in What It Takes right now. Cramer’s unexpected death ten days ago (NYT obituary here) prompted numerous appreciations, all emphasizing the book’s greatness. At 1,047 pages, the book uses exhaustive research and vigorous, detailed reporting to delve into the passions, idiosyncrasies and flaws of George Bush, Bob Dole, Michael Dukakis, Joseph Biden and other candidates as they fought for the presidency in 1988. As he reported for the book, Mr. Cramer spent time with the candidates’ relatives, college roommates and sometimes even their elementary-school teachers. He grew close to the candidates themselves and in some cases formed friendships that endured after the election. Mr. Biden later gave him tips on fixing up an old farmhouse that he purchased in Maryland, Mr. Cramer said. I first encountered “What It Takes,” Cramer’s magisterial account of the 1988 campaign, as a college student. It was a dangerous book to read so early in one’s career—like falling in love with the idea of becoming a novelist after reading “Finnegans Wake.” Cramer did not really write about politics. He wrote about people who happened to be involved in politics. It was a revelation to learn that campaigns could be covered through deeply reported studies of the characters who inhabited the campaign trail. Though no campaign book has come close to accomplishing what Cramer’s did, he taught a generation of political writers that the two pillars of great nonfiction—immersive reporting and expert storytelling—could turn even a mediocre campaign into high drama. Now, I’ve read that sentence, and that story, “What Do You Think of Ted Williams Now?” at least twenty-five times, and I’ll never be able to do justice to what makes it so great except to say it’s a handshake of a sentence — brisk, warm, offhand, relaxed, firm, honest, and man-to-man, the kind that accompanies a promise. It’s the sentence of a writer who is himself about to try for the best ever, and is willing both to let you in on what he’s going for and to do whatever’s necessary to make good. But if “What Do You Think of Ted Williams Now?” was a promise, it was still just a magazine story, and not long after it was done, Richard Ben Cramer began the long process of keeping it, in a book. Few men try for the best ever? Damned right — and he was about to show us why. He began following all the men who were running for president in in 1988, in order to define what it took to be president, in a book timed for the election of 1992. He called it What It Takes, and it was a title that bore the same relation to his 1,047-page endeavor as the first sentence of “Ted Williams” bore to what was to follow — it was a title that announced the nature of his project and set the height of the bar. When he was writing it, there were rumors of what it took him to write it, rumors of lost money, lost health, and even lost teeth. He would keep his promise, or die trying, and the book he wrote was not just the best-ever about a political campaign, it was one of best ever about men trying to be the best ever: about ambition and its costs both small and large, which he curated with an exacting and infinitely forbearing eye. Then I read this amazing book about the 1988 Presidental Election, called “What It Takes” — I read all 1,051 pages and I wanted it to last so much longer. I read parts of it again. And again. Every few weeks, even now, I read a section or two. I just pulled down my paperback version of the book, and it’s dogeared and underlined and warped in some weird way. Every page of it courses with ambition and crackles with joy — parentheses everywhere, exclamation points, nicknames, purposeful misspellings, ellipses, star breaks, it’s a big and sprawling Scorsese movie, no, five big sprawling Scorsese movies cut into one. I was shocked when I learned that there were critics who did not love his writing. I mean that sincerely — shocked. Yes, of course, writing is utterly subjective, and what’s great to some is unreadable to others, but Richard’s writing felt universal to me. How could you not love it? He was hilarious. He was furious. He was, most of all, constantly surprising. I just cracked open “What It Takes”and re-read the opening scene of George H.W. Bush at the Astrodome, throwing out the first pitch, how it is a political mortal lock and how it is also a political disaster in the making, and no matter how many times I read it I find myself slightly unsure how it will end and thrilled when I get to that end. You can see why I thought to give What It Takes a try. The beauty of 1050-page books is that when you download the free sample from Amazon, you get fifty pages. Fifty pages will get you through the 28-page opening chapter on Bush at the Astrodome and well into the second chapter, on Bob Dole back in DC the same day, October 8, 1986. You might think you don’t care about Bush and Dole. You might know you don’t care about the 1988 presidential election. Dukakis photographed in the tank. Willie Horton. George Bush selling his soul by giving Lee Atwater free rein to take the campaign into the gutter. That about covers it, no? But read the 50 pages that Amazon offers for free and you’ll care. Cramer is that compelling a storyteller. Bush and Dole are that compelling as people. I’m just five pages short of finishing Book I, 156 pages devoted entirely to the pair. We’ve gotten from October 1986 to December 1986, with Cramer filling in their family histories and their war experiences. It’s no secret that Bush’s plane was shot down over the Pacific in 1944 and Dole was severely wounded in Italy in 1945. Cramer’s depiction of these events is utterly gripping. Dole’s slow and unexpected recovery is a wonder. You find yourself caring about them deeply. I haven’t even addressed Cramer’s extraordinary writing style. I could quote gems from any page. Then again, you can just read the opening pages at Amazon, and you should. Go to the webpage, click on the image of the book, start reading. Okay, I’ll give you a sample, about Bush. The thing that was neat about Air Force Two was the way it helped him make friends. He’d be doing a state, so he’d get the Congressmen, State Party Chairman, or State Treasurer, even a County Chairman or two, and ferry them along to the next event. They loved it. They’d talk about it for the next year. That was one beautiful plane! Actually, it wasn’t just one: any plane he rode was called Air Force Two. In the bad old seventies, when Mondale was Veep, and the government still worried about things like fuel and noise, the Vice President flew on small, efficient DC-9s. But now, in the age of Reagan, Bush mostly flew a big old 707, the Stratoliner, a Cadillac-with-tailfins kind of plane, so heavy, noisy, and greedy for fuel that no commercial airline would be permitted to land one at an American airport. The Air Force had enough of the behemoths to keep two on call for Reagan, maybe send another overseas with a Cabinet Secretary, and still give one (or one and a backup) to Bush, to ease his travels. On most trips, he got Number 86-6970, which was the first jet a President ever flew. It was delivered for Ike, at the end of his term, and it was JFK’s number-one plane. Sometimes Bush got Number 26000, the plane that flew LBJ back to Washington after Kennedy’s assassination, on which he took his oath of office in the nation’s darkest hour. Of course, by the time a guest learned any of that, he felt like he was riding a shrine. This is one hard book to put down. Even so, at 1050 pages, it’s going to take a while. My new year’s resolution is in good hands.